The LifeSmart infrared fireplace is designed to heat a larger area (1,000 square feet) than standard electric fireplaces (400 square feet). This makes it ideal for those using a zoned heating strategy. The infrared heat system places this electric fireplace heater in select company regarding heating capability. The cabinet is furniture grade and very attractive with some heft to it. It is has caster wheels that make it easy to move from room to room and completely portable despite its solid construction. Please look at the dimensions of the fireplace carefully, it is not large. The flame effects produced by this infrared fireplace are almost universally regarded as being very realistic looking. Of course they are not exactly as realistic as a real fire. The flame effects are designed to be natural in color and behave as a real fire. There are no special effect colors or special ambient lighting effects. There are 3 different settings for the intensity level of flames, the brightness.. The flames can be operated without the heat function. The actual flame viewing area is approximately 18 inches wide by 13 inches high. 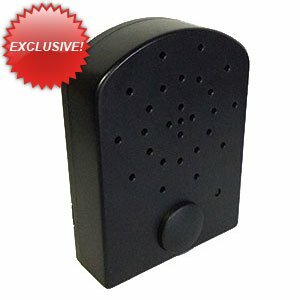 The flame effects are controllable with the full function remote control. The light effects are produced by 2 E12 small socket base candelabra or chandelier 25 watt incandescent bulbs. Manufacturer states not to exceed 40 watts per bulb. So you could bump up the brightness a bit. 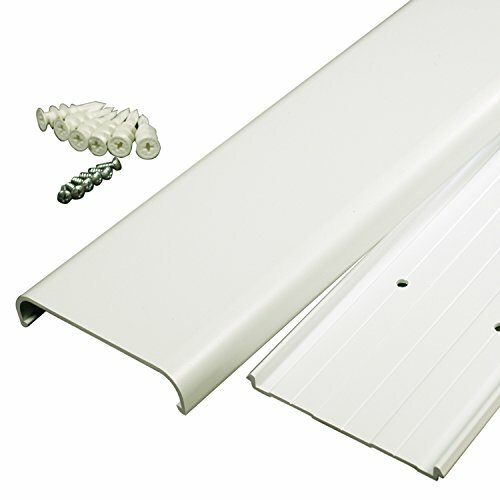 These are accessible by unscrewing 6 screws and removing the rear access panel. 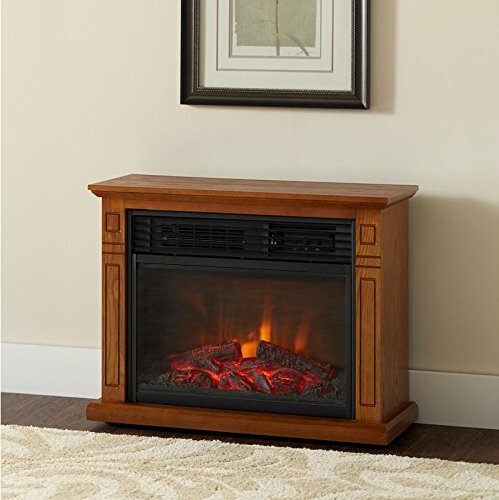 The distinguishing feature of this fireplace heater is its infrared heating system. This infrared heater uses 3 infrared heating elements converting electrical energy into heat. They emit long-wave infrared radiation, which strikes a solid nearby object and converts that radiation into heat. Infrared is not absorbed by the air. It does not blow hot air, but rather warms objects. It takes longer to heat a room. As with most electric fireplaces it is probably best to think of it as a supplemental heat source rather than primary. There is no venting or duct work necessary. The claim is that this heater can heat up to 1,000 square feet. There appears to be a split of opinion between owners as to whether it can actually do so. There is no question that it is more than adequate in standard size rooms. But in larger rooms variable factors come into play. The variables are the room layout, the flow of the room, ceiling height, and insulation values existing in the room. There are reports of it heating an open concept 1200 square foot house quite well, yet struggling with a 400 square foot basement with concrete floors and outside access. There is, however universal agreement that his does a better job of heating more space than the standard non-infrared electric fireplace. Whereas a regular electric fireplace may struggle to heat their claimed 400 square feet, this unit will heat that space easily. This unit may struggle to meet its’ claimed 1000 square feet. The heater as 2 settings high and low, which draw 1500 and 1,000 watts respectively. At full heating capacity it produces 5100 BTUs. The fireplace has a thermostat that can be set to maintain a specific temperature. The heat will cut off when it reaches that temperature. Almost everyone viewed the noise level as acceptable; some comments were that it was about as loud as an aquarium, and that it was like background white noise that was barely audible 6 feet away. The controls are handled manually by the control panel located on the top right front of the fireplace or by using the full-function remote control. The manual controls consist of a power on off switch, a dimmer switch to adjust the flame effects levels a temperature up, and temperature down button to set the thermostat, a high/low button to toggle the heat levels. Somewhat oddly, there is also a button to show temperature levels in Celsius or Fahrenheit. As mentioned previously the remote control is full function you can control heat levels flame effect levels as well as turning the unit on and off. There were a few complaints from owners concerning the fact that the 2 AAA batteries (which are not included in purchase by the way) are held loosely in the remote. It is very common to have to take the back off the remote and re-seat the batteries. This seems to be a frequently occurring minor annoyance. The fan will continue to run for a while after unit is shut off even after the heater automatically cycles down. The fan continues to run so that every last bit of heat is blown out of the heat chamber while allowing the unit to continue filtering your air. We should also mention that the cord length is 5 feet which is relatively short for an electric fireplace. 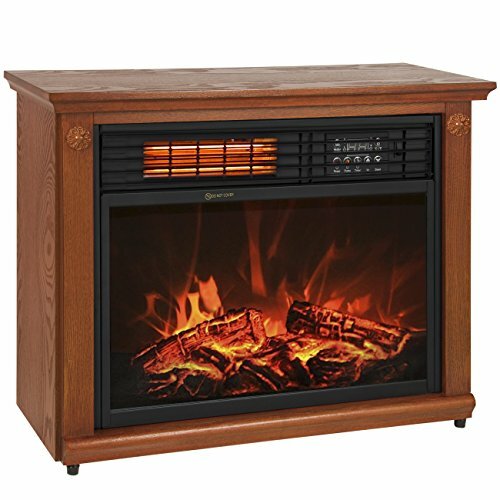 The LifeSmart infrared fireplace is designed to be plugged into a grounded 120 V 60 Hz power outlet. 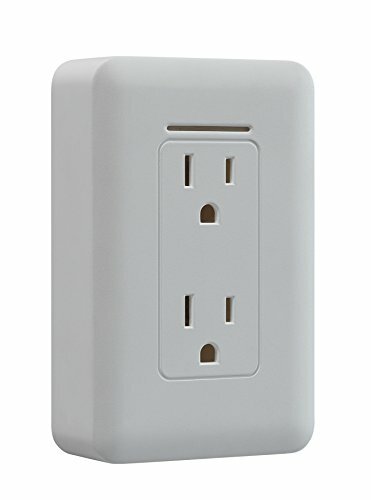 This is a standard household outlet. We recommend that no other appliances are plugged into the outlet being used by the heater. This should prevent tripped breakers or blown fuses. The unit does have an overheat safety feature. There is a sensor inside the unit and if internal parts reach a temperature warm enough to cause overheating or a possible fire, the unit will automatically shut off. There is also a tip over safety feature. Should the heater be tipped over, there is an internal switch which will shut the heater off automatically. Once you set it right, the heater will have to be reset. That being said, if you must use an extension cord (which we do not recommend), make sure it is a heavy gauge wire rated higher than the maximum wattage and amperage output and grounded. In this case it should be greater than 1500 watts and more than 15 amps. For complete electric fireplace safety information: Click Here. The setup for this unit is as simple as it could be. Take it out of the box, plug it in, and you’re good to go. You will have to obtain and insert the batteries in the remote control. It is recommended to have the fireplace setting on a level surface. Operating the fireplace with just the flame effect should cost about 2 to 3cents per hour. That is the cost calculated of the 2 bulbs and light motor. Therefore, using the flame effects mode and assuming 4 hours of use each and every night it would add about $2.00per month to your electric bill. If you operate in heat and flame mode it will cost about $.12 per hour. So, running the unit every night for 4 hours @ rated max of 1500 Watts would add $21.60 to your electric bill. The 3 variables that will greatly affect your actual cost are how long you run the unit each month, your heat setting, and the cost of electricity in your state. 1. determine your states cost of energy per kilowatt hour by either looking at your bill or going to this site: (use residential column). For examples above, I used the US average of $.12/KWH. Here is the site to determine: Your states energy cost. 2. Then go to this site for the Cost Calculator . Fill in the following values: Values= 1500 watts high heat + flame, 1000 watts for low heat and flame. Fill in your states KWH cost, the hours you think you will use it per day or month and generate results. Greater heating capability than non-infrared electric fireplaces. Very attractive and surprisingly realistic fire and flame effects. ‘Cool Touch’ exterior makes it kid and pet safe and friendly. E-Z Glide Casters make it a snap to roll from room to room. Over heat shutoff and tip over shutoff – 2 great safety features. You must be clear on infrared heat advantages and disadvantages. Takes longer to initially heat a room. Remote control sensitive to jostling – need to re-seat batteries. Batteries (2 AAA) not included for remote control. Click Here for a great article on the general pros and cons of electric fireplaces. In general, 3 out of 4 buyers rated this a 4 or 5 star electric fireplace heater. Most of the negative reviews concern either shipping damage (a very small minority) or downgraded their review because of heating characteristics. Most negative reviewers did not understand infrared heating characteristics. In the heating section we went to great length to accurately set your expectations on heating capacity. Virtually everyone was satisfied with the flame effects. At under $200 (make sure you are looking at FireSmart model# LS2002FRP13, not the similar but more expensive model LS-IF1500-DOFP), the combination of low price and better than average heating capability features make this a best selling infrared electric fireplace on Amazon. It is a great value at its’ pricepoint. Although there are even lower priced electric wall mounts, they also have markedly less features than this one. The fire and flame effects are very good. The cabinet is hefty, good looking and on casters. The fact that this fireplace is really designed to be an integral part of a zone heating plan. 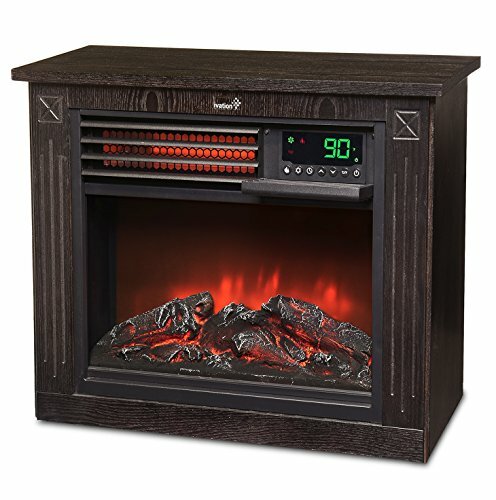 This electric fireplace heater is designed to be moved from room to room as you need it. The limited warranty is 1 year.